In previous blog posts, I discussed the eerie similarities between movie posters. Despite the fact that many of the posters have the same visuals and overarching theme in order to target the same audience, most of the artists that create movie posters agree that it is not copyright infringement because enough has been changed: the font, the characters, the background. Originality in movie posters comes from the “inspiration” of other posters that were effective. Other artists have sued over movie posters, however. In a 1987 court case, artist Saul Steinberg sued Columbia Pictures Industries, Inc. for copyright infringement of his art. 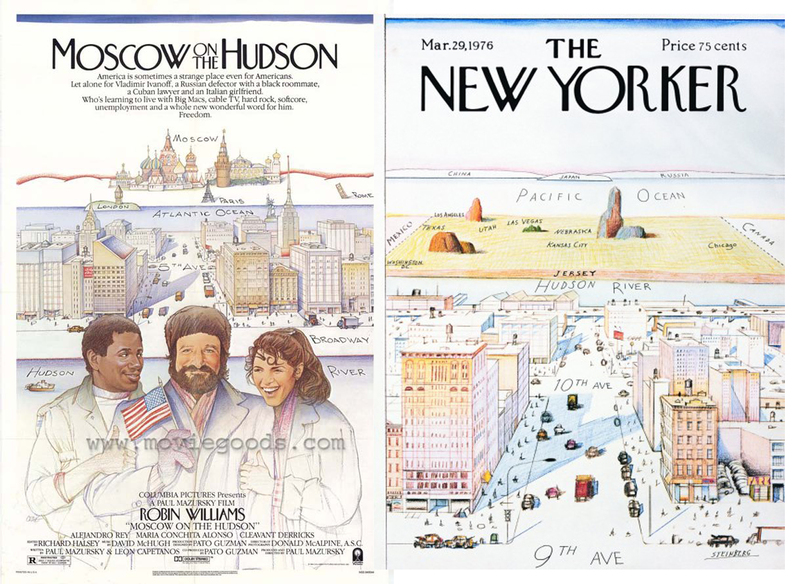 Steinberg argued that the movie poster from Moscow on the Hudson was too similar to his original work, View of the World from 9th Avenue, published on the cover of The New Yorker. If we compare the two images, we see the striking similarities that Steinberg argued for. The color and shadow (down to the angle of the building), the use of cars and lettering on the street, the perspective of Moscow and the Pacific Ocean, respectively. Even the lettering for “The New Yorker” and “Moscow on the Hudson” is in the same font style, a font that The New Yorker often utilizes. Columbia Pictures Industries, along with many other movie and record companies being sued for the association of the poster, argued that they were using the poster under the fair use factor, parody. Stanford University easily summarizes the definition of parody: “In a parody…the parodist transforms the original by holding it up to ridicule. At the same time, a work does not become a parody simply because the author models characters after those found in a famous work.” A parody, in short, must highlight the extremes of the nature of a work to make another point about it. Judge Louis L. Stanton believed, in this case, that Steinberg had created the parody about New Yorkers by arguing their perspective about the world, not the movie poster. Columbia Pictures Industries, Inc. may have found inspiration in Steinberg’s work, by had only borrowed the parody that Steinberg created instead of making their own. Because they were not arguing for anything else, but using the poster to argue the same effect as Steinberg, Steinberg won his court case on the grounds that too much had been copied. Judge Stanton believed that the perspective itself was not copyright (the poster was free to use the subjective perspective of New York citizens), but the use of other similarities was indeed a copyright infringement. As a comparison, a movie poster for Naked Gun 33 1/3: The Final Insult featured Leslie Nielsen’s head photoshopped onto the body of a pregnant woman. The poster was a direct echo of a Vanity Fair cover featuring a naked and pregnant Demi Moore. Photographer Annie Liebovitz, who had taken the picture of Demi Moore, sued for copyright infringement because of the way that the photo had been digitally manipulated to mimic her own style. Viewers can see the similarities between the angle, shading, general composition of the photo and pose of the models. However, Paramount won this case because of the notable changes they made to the picture as well. First and most obvious is the change from Demi Moore’s face to Leslie Nielsen’s, and the expression that each wear on their faces. Second is the size of the ring on the right hand of the model: Demi Moore’s is the general size of a wedding ring, while the other is more obnoxious. Third, the lighting is significantly different. On Vanity Fair, the light is soft and highlights the beauty of a pregnant woman. On the Naked Gun poster, the lighting is crude and points out the obvious flaws of a man being pregnant. Because of these changes and their implications in highlighting the differences between the pregnancies and genders, the courts concluded that Paramount Pictures Corp. was making a parody of the work. They used the style of Liebovitz to make another point: there is something obnoxious and not at all beautiful about a man being pregnant. Steinberg v. Columbia Pictures Industries, Inc. became a precedent case for when fair use did not apply and when parody was not effective. Leibovitz v. Paramount Pictures Corp. became a case for when the images fell under fair use. The distinction between commenting on or criticizing a work and simply copying it became clear.